Officially founded in 1822 the city of Port Elizabeth is the motor capital of Africa, with a large Volkswagen large assembly plant and Mercedes 150 miles up the coast at East London. Its history goes back much further, with the first Europeans visiting the area in the late 15th century, the Dutch and Portuguese using what was then called Algoa Bay as a watering and replenishing stopover. 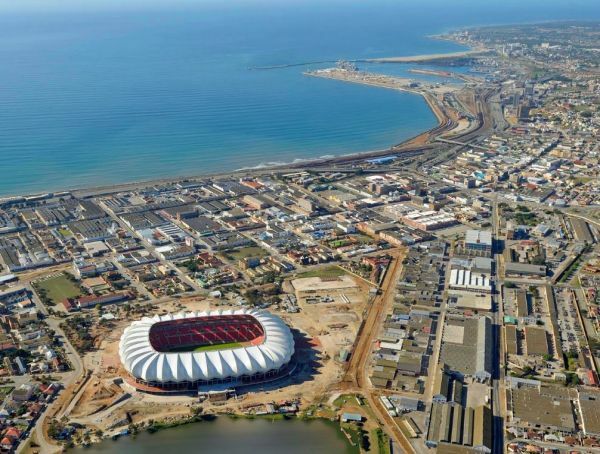 The area has in more recent times renamed itself Nelson Mandela Bay after its greatest protégé. The city is named after Elizabeth Donkin, wife of a British governor of the Cape Colony. She died at the age of 27. While he did remarry, exactly 20 years to the day he committed suicide and is buried next to her. Port Elizabeth is often called ‘The Friendly City’ and ‘The Windy City’ and tends to live up to both designations. It is about half way between Cape Town and Durban, the top end of the Garden Route, natural beauty running all along the coast. 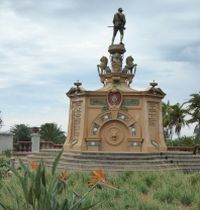 PE, as it is known locally, is very British in its outlook and is also the home of the St Georges Park cricket ground, which way back in 1889 hosted the first-ever South African test match, England winning by eight wickets. En route from Reunion Island to Cape Town on Cunard’s Queen Victoria, your editor-in-chief spent a relaxing day, the harbour within walking distance of the old historical area. Our plan, typical of port visits, was to hire a car and guide/driver, the Rand being of particularly good value. With email, and recommendations, it is a very effective way of making the most of what is only a few hours. While the weather was fine, and the temperature English summer, the day was misty and some of the panoramic views promised proved to be out of the question. Kragga Kamma Game Park lies on the outskirts of Port Elizabeth and just a 30min drive. Once a farm, it can be compared with Woburn and should not be muddled up with a safari park, which is much larger and more natural. There are giraffe, white rhino, buffalo, waterbuck wildebeest and zebra roaming around freely. Also bush buck, nyala, a multitude of birdlife, including the striking Knysna Loerie, are to be seen. 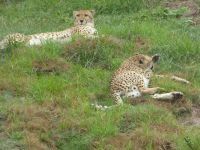 Wisely, the cheetahs are kept in their own fenced-off area. What was particularly good was the tree walk, through what was termed ‘the monkey walk’, including a rickety wooden bridge, with a restaurant at one end. Private vehicles must keep to the tracks and the rules posted at the entrance kept to. Visitors with more time on their hands can rent a game lodge, perfect to see the animals rising as the sun comes up. 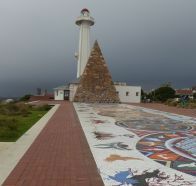 The historic centre of Port Elizabeth overlooks the harbour and was extensively tidied up for the 2010 FIFA World Cup. The centrepiece is the old lighthouse, which you can still climb, but not practical for those of a large girth or exceptionally tall. Next door is a fine information centre with all manner of leaflets and guides, including a guide to around 60 museums and places of exceptional interest. For unexplained reasons, a centrepiece of the area, called the Donkin Reserve, is an architectural study model which looks suspiciously like Concorde (see BTN 2 May 2016 AND FINALLY). Nearby, the ‘Voting Line’ of steel cut-outs symbolises Nelson Mandela, his love of children and of people waiting in turn to cast their vote on 27 April 1994. 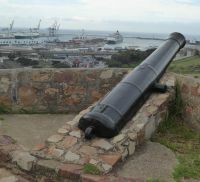 Nearby is Fort Frederick, built 1799 during the Napoleonic wars, the guns never fired in anger. Lunch was in the middle of a garden centre (Sera Maior) and clearly very popular. No problems with fresh vegetables and under cover when the heavens opened up for a short period followed by fine sunshine. Walking the meal off in the nursery area, we found an abundance of flowers and colourful plants ready for sale. Some of the suburbs of Port Elizabeth are very pretty and prosperous, others less so. It will take decades for the vestiges of the appalling apartheid (1948 to 1994) regime to be eliminated. Our afternoon was nice and relaxing, more a resort-type experience than looking at nature and history. South of PE is Schoenmakers Kop and Marine Drive with some delightful homes bordering on the Indian Ocean. Golf is popular and there are both public and private courses, both links and open parkland, including the par-72 Humewood Club, which has hosted the South African Open. The coastal road leads into the seaside hub of Summerstrand and Hobie Beach, a combination of calm waters and fair breezes providing, it is said, some of the best surfing conditions in the world. Nearby, the Boardwalk Casino and Entertainment World, Brooke's Pavilion and the Lighthouse Entertainment Centre offer amusements, shopping, dining and gaming. The area is popular for family holidays, with a Radisson Blu hotel dominating the skyline. Central PE is less than 15min away. 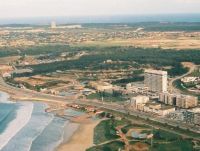 Port Elizabeth has a small modern airport less than one mile from the centre with frequent services to Cape Town, Durban and Johannesburg for connections to international flights. It is a very welcoming city developing its tourist image. If the Rand continues at its present level, and flights to South Africa expand (BA and Thomson will this winter increase ex-UK schedules), there is every reason for growth, either for a seaside holiday, or for those that want to see nature in the raw. Or both. For the cruise ships, it is perfect, one sea day between either Durban or Cape town. Add Port Elizabeth to your South African tour plans.